Malala Yousafzai, a 19-year old education activist from Pakistan, became the 6th person to receive honorary Canadian citizenship. "Welcome to Canada, is more than a headline or hashtag,“ she said. “It is the spirit of humanity"
Malala Yousafzai is a 19-year-old education activist, Nobel Peace Prize winner from Pakistan. And on Wednesday she became only the sixth person in history to receive honorary Canadian citizenship, at a ceremony held in Ottawa and graced by the Canadian Prime Minister Justin Trudeau. She commended Canada for opening its doors to refugees as other countries such as the U.S have sealed their borders. She humorously mentioned how her peers were gushing at her opportunity to meet the young Canadian Prime Minister who sports tattoos and practices yoga. 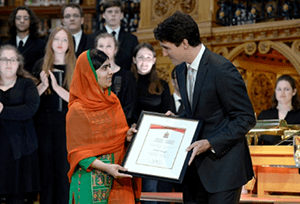 Yousafzai became the youngest person ever to address parliament and received a certificate and a Canadian flag from the Peace Tower. 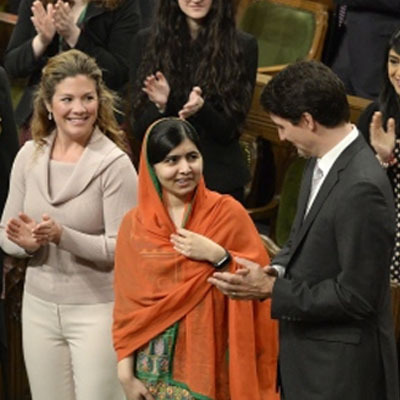 Present were her father Ziauddin Yousafzai and mother, Toor Pekai Yousafzai who were filled with emotion as they rose from their seats, hands on hearts, as Malala was acknowledged by the House speaker Geoff Regan. Yousafzai was targeted by the Taliban at the age of 15 for speaking out on the rights for girls to learn and attend school. She survived the attack by masked gunmen to become an iconic international activist. She later moved with her family to Birmingham, England where she founded the nonprofit Malala Fund and co-authored the best-selling book I am Malala. A co-recipient of the 2014 Nobel Peace Prize, Yousafzai became the youngest ever person to receive the accolade. Recently she has been as a UN Messenger of Peace by the United Nations Secretary-General, Antonio Guterres, the highest honor given by the world body. As a father and former teacher, Trudeau said he understands that education is the key to solving the world’s challenges, including ending poverty, fighting climate change and preventing wars. “We know that only through education can we achieve real peace,” he concluded.